Few diamond shoppers can walk into a high-end jewelry store and buy a 5-carat, D color, Internally Flawless diamond with Ideal cut parameters. If you are like most diamond shoppers, you have a limited budget. However, you still want to get the biggest and most beautiful diamond within your budget. You can take some simple steps that will ensure you get the biggest diamond possible.1) Diamonds have price per carat increases at the most popular carat weights (0.50, 1.00, 1.25, 1.50, 2.00, etc.) because that is what shoppers request when they go into a jewelry store. Your dollars can go further buying a diamond that has a carat weight just under those weights. For example, a diamond that weighs 0.90 carats can be the same millimeter diameter as a diamond weighing 1.00 carat but cost $1000 less.2) The price of diamonds is very sensitive to color grade, yet most shoppers have a difficult time seeing the difference between some of the color grades. If you buy the lowest color grade that looks beautiful to your eyes, the lower price per carat allows you to buy a bigger diamond with your dollars. The highest color grades (D, E, and F) are categorized as colorless. 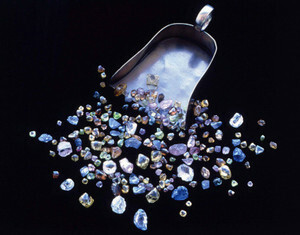 The next color grades (G, H, I, and J) are near colorless and the source of beautiful diamonds at much lower prices. 3) A ring with several smaller diamonds is less expensive than a single diamond with the same total carat weight. For example, three 0.50 carat diamonds will cost a fraction of what a single diamond weighing 1.50 carats. The same holds true for a 1.0-carat center stone with 0.25-carat diamonds on each side. If you want a finger full of diamonds with a limited budget, consider several diamonds rather than a solitaire.4) All diamonds have inclusions; the key is what you can see with your eye. Once a diamond is clean to the eye (VS2 or good SI1 for brilliant cut shapes), higher clarity grades have no impact on the beauty or appearance of a diamond, they only add to the expense. Get the lowest clarity grade you are comfortable with and save a lot of money will no sacrifice in beauty.5) The shape of the diamond can affect the millimeter size. Of course, you should always get the diamond shape you like best but some shapes do look larger than other shapes. Ovals, marquises and pear shaped diamonds generally look larger than round or square diamonds with the same carat weight.6) Even diamonds with the same shape and carat weight can be different sizes. The cut of the diamond can influence the millimeter size. Shallower diamonds tend to be bigger in length and width than deeper diamonds. It is similar to two men each weighing 200 pounds, where the smaller waistline probably results in a taller man.7) The type of setting you select to hold your diamond can influence the diamonds perceived size as well as affect the dollars you have to spend on the diamond. White gold settings cost about one-third of platinum settings, leaving more money for your diamond. Bezel set diamonds or diamonds with pave around the center stone can make the diamond appear bigger. 8) Perhaps the most important factor in getting the biggest diamond for your dollars is where you purchase. The retail markup on diamonds can range from well under 10% with online retailers to over 200% at high-end jewelry stores. Finding a retailer with very low overhead and low prices will ensure more of your dollars go for your diamond. Why spend your money for polished marble floors, fancy display cabinets, and elaborate store interiors, all things you cannot wear out of the store?In the end, you want to go with the diamond that excites you and makes you happy every time you wear it. That is the best indicator that you have made the right decision and have the best diamond for you.